What: For the past several years, over 250 rafters, kayakers, cyclists and pedestrians have come together and successfully removed over 2 TONS of garbage from Denver’s South Platte River corridor. The event has received local and regional attention as the best river stewardship event in the Metro area. 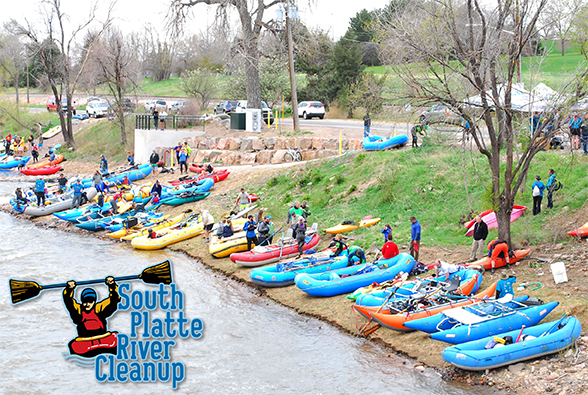 This year High Country River Rafters, in partnership with Down River Equipment and Confluence Kayaks is presenting the 14th Annual South Platte River Clean-up, and we need your help to make it the MOST SUCCESSFUL YEAR YET! Participating in the Clean-up is a great way to give back to your community and take care of the river that winds its way through the heart of Denver. Registration is FREE and there's a terrific after party! Event Details: Participants can join by raft, kayak, or other water craft. Please note that rafts and inflatable kayaks are easier to carry trash. We also encourage people to participate by bike or by foot! If you do not have a ride on a water-craft, there will be a very limited amount of available seats on rafts. PLEASE bring a LIFE JACKET (PFD)!!! Please arrive early and properly dressed (river appropriate life jacket, water shoes, river attire, etc.) and we will try to find you a ride. Trash bags, trash pick-up sticks, and gloves will be provided. Check In/Registration is located on the S.W corner of Florida Ave. & South Platte River Drive. We will have a booth set up by the river. There will be temporary parking available along the road (Click HERE for map). Registration will be open between 9:00 am and 11:00 am. Please check in at the booth, sign the waver and grab your t-shirt. T-shirts will be given out on a first-come first-serve basis. To help speed up the registration process, please DOWNLOAD THE WAIVER HERE, fill it out and bring it with you. Give your waiver to the volunteers at the registration booth. You will then receive your two wrist bands for 2 FREE beers. *NOTE: Please bring your valid ID to get your drink wristband. We will NOT be able to give out replacement wristbands so please DO NOT loose them. Put In: The put-in is the same location as the check in (S.W corner of Florida Ave. & South Platte River Drive). Unload your raft, kayaks, other water-craft, and your passengers at the put in. Once done, please move your vehicle and craft for others to unload. Take Out: The take out is located at Fishback Landing, right by the Denver Aquarium (Click HERE for map). There will be volunteers to help unload your trash and take it to the dumpster. Shuttle Rides Provided By: Geo Tours and other volunteers. They will be picking up at Fishback Landing next to the Denver Aquarium. There is limited parking, so PLEASE Car-Pool! Meet up at the put-in off Florida Ave.
Drive down to park your car at the Denver Aquarium. *NOTE: Parking is FREE at the Denver Aquarium. Just mention that you are with the South Platte River Clean Up. After Party: Join us from 4:00 pm - 8:00 pm for the after party at Confluence Kayaks. The event will be held in their parking lot with a tented area. Show us your drink wristband and receive 2 FREE beers provided by Good River Beer.